Microsoft Visual Studio 2010 Ultimate Beta 2 is ready for testers also. There is Few basic Test projects are available for testers and developers. 1. 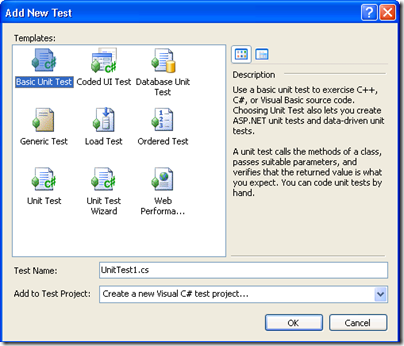 Basic Unit Test: Unit test supports C++, C#, VB. By using unit test you can create a unit test project which can call methods, pass parameters and verify return values. 2. Coded UI Test: CodedUITest is very good feature of VS2010. Coded UI Test allows you to record screen actions to perform UI Testing. 3. Database Unit Test: This test is used to test database object, You can test database functions, procedures, triggers etc. 4. Generic Test: A generic test is existing program that has been wrapped to function as a test in VS.
5. Load Test: Load test will help you to test application with virtual multiuser platforms. 6. Ordered Test: Use to test particular cases in certain order. 7. Unit Test: I is advance version of Basic unit test and perform same kind of functions. 8. Unit Test Wizard: Its same as Unit test while you can generate the unit test from your source code and customize them as per requirement. 9. Web Performance Test: You can test website performance by using performance test inside the load test.